How many faces will you see? In this mirror meditation, you will see faces from your previous lives, faces from the collective, aliens, faeries, people of other races and other times. You may even see demonic images but do not be scared because they cannot harm you. 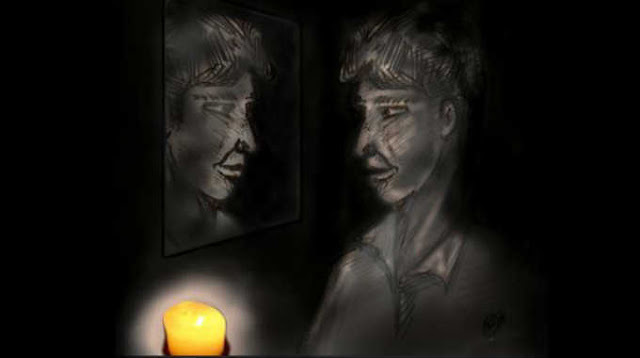 Once you’ve protected yourself, place a mirror in front of you, light a candle and turn off the lights. Focus on the spot between your eyes where your 3rd eye would be. Due to the dimness of the room, you will find your eyes going in and out of focus and this is perfectly normal and expected. Try to avoid excessive blinking because it is in this state that the faces will appear. Your third eye will begin to open and reveal these faces. Many times, you will see various genders, ethnicities, races and sometimes, demon-looking entities. Do not be afraid. These nefarious entities cannot harm you and may be a shadow self side of you, or they may be simply testing your spirituality. If you sense and negative energy from these energies, you can always ask them to leave, then restart your protection techniques as you did before you began this meditation. In my own experience doing this mirror meditation, I have seen myself as many different ethnicities and races as well as both genders. I have also seen a demonic-looking entity with glowing, red eyes and fang-like teeth but I remained calm and told it that it was not welcome during my meditation and I asked it to leave. This meditation is not for the faint of heart. If you think you are ready to try it, please be sure to follow the recommendations on what to do before you meditate. It really is quite fascinating to see the many sides of yourself as ultimately, you are a spiritual being having a human experience while incarnating many times, in various ethnicities and races and different genders. Through this meditation, they will all be shown to you.